The Spring Equinox falls on March 21st in the Northern Hemisphere, and is one of the four Fire Festivals. It’s the time of year when days and nights are of equal length, when light and darkness are in balance. Some call this festival Ostara or Eostre, after an ancient fertility goddess of spring, and there’s a theory that this is the source of the word ‘Easter’. The Christian festival of Easter takes place every year on the first Sunday on or after the first Full Moon after the Spring Equinox. This seems a strange way to fix the date of such an important Christian event, but often the roots of one religion can be found in another. This pagan festival is a time of renewal and regeneration, as the earth really starts to come to life after the cold winter months. Imbolc in February is the time when the first signs of new life appear; the Spring or Vernal Equinox in March is when it really starts to happen, and by Beltane in May, spring is well under way and edging towards the warmth of summer. The goddess Ostara or Eostre (whose name some believe is the root of the word ‘oestrogen’) represented fertility and growth. She’s depicted as a beautiful young woman, fecund and ready for reproduction, unlike the young maiden of Imbolc, who’s just approaching womanhood. The egg is a major symbol of this spring festival, as a potent emblem of new and growing life. For centuries, and in many cultures, eggs have been dyed or painted, and often hidden for others to find. We’re now inundated with over-packaged chocolate eggs in every supermarket and newsagent across the land, but the origins of the egg as a spring symbol are very old indeed. Small cakes or buns are also associated with this festival, marked into four quarters to represent the four Fire Festivals or the four elements – the original Hot Cross Buns. Another modern icon is the Easter Bunny. In fact the hare is the totem animal of this spring festival, linked with fertility and also the act of reproduction itself. 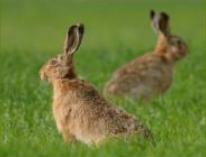 Watching a group of hares in a field at this time of year can be an enlightening experience! And boxing hares, thought by many to be two males fighting over a female, are in fact the female interacting with the male. The hare has also long been associated with witchcraft, and in folklore it was said that witches could transform themselves into hares. Hares are magical creatures, known to be moongazy, and are renowned as shape-shifters, or animals of transformation. A close encounter with a hare is said to be an indication that some kind of personal transformation will take place soon. 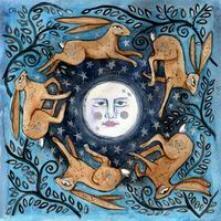 There are also traditional tales of the hare laying eggs in a nest at this time of year. This may derive from the fact that the skylark lays eggs in a nest on the ground in the same kind of habitat where the hare builds her own nest (a form) for raising her leverets. Anyone interested in hares, and the mythology and folklore surrounding them, should take a look at a lovely book by Karen Cater of Hedingham Fair, entitled “Spirit of the Hare” – it’s a beautiful publication with a great deal of information about hares. At Stonewylde, the standing stones in the Stone Circle are decorated with ‘a carousel of hares’, and also a beautiful pattern of spring flowers: violets, primroses and celandine. The great stone behind the Altar Stone is decorated with a painting of Eostre, depicted as a beautiful young woman with flowers in her hair, stars around her head, a hare by her side and an egg in each upturned hand. The children make masks (hares, chicks, lambs) and perform a dance and drama which symbolises the potency of new life growing, as the weather becomes warmer and the days longer. 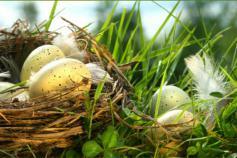 Eggs are blown and decorated, hidden in the grass and hedgerows around the Village Green and riverbank. The children go on an Egg Hunt and bring their finds back to the Barn where the lovely eggs are put on display and the children rewarded with cinnamon buns. 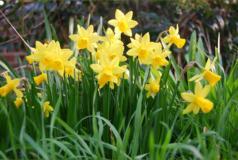 The Spring Equinox heralds the real start of the growing season at Stonewylde, when the agricultural work really begins.